One of the beautiful parts of this writing life is the friendships and fellow artists I've gotten to know over the years. I'm physically unable to read and recommend everything I get sent or am asked to recommend, but there have been a few projects recently I am so excited to share with you. Some by dear friends, some by acquaintances, and all by people being faithful with their gifts. Several years ago the folks behind The Heart of Man reached out for help in getting their Kickstarter out. I was all too happy to spread the word then, and haven't heard much about the project since then. Recently the trailer was released and I saw why: because they were busy doing everything with excellence. I cannot encourage you enough to gather a group of people together to view this film. Here's a film about the life of one of my personal heroes, Wendell Berry. It also has a limited release, but maybe it's playing near you somewhere. Our plan is to purchase the film, fill our living room to the brim, and project it on the wall. Maybe you could do something like this. I know it will provide food for thought. You might remember a few years ago Stephen McCaskell directed a documentary on the life of Spurgeon. It was spectacular. He has recently completed another documentary, this time on the life of Luther. I haven't gotten a chance to view it yet, but it looks fabulous and would be a great way to celebrate the 500th anniversary of the Reformation. Gather a group together to view this one too. It's available here on Amazon streaming. A few months ago my friend Jared Wilson released his book The Imperfect Disciple. The night I got it in the mail a friend came over and was interested in reading it. Since I had a stack of other books I was trying to get through, I lent it to him. I just got it back a week ago and have devoured it during my morning reading time. Not since Zack Eswine's Sensing Jesus (now The Imperfect Pastor) have I encountered a book so freeing for imperfect Christians. If that's you (and that is you), I recommend it. A few weeks ago my friend Ruth released her art in the form of painting and words in her book Gracelaced. It is truly a masterpiece. Ruth is one of my favorite people to follow on social media for her vulnerability, faithfulness, and always present love of the word of God. I hope you'll check out this book (and its accompanying journal). Years ago Shawn and his wife Maile came over for dinner on their way through Texas and told me about the book that would eventually become my favorite. They named their son after the title character so I knew then they must be serious lit-nerds. Shawn's appreciation of good writing is the foundations for his book The Day the Angels Fell, which is great literature! Nate picked it up and read it in one afternoon, citing its similarity to Peace Like a River, Chaim Potok, and Ray Bradbury (three of his favorites), so I knew it would be good. And it is. It's a young adult novel, and would make a great read-aloud for discussion as a family. 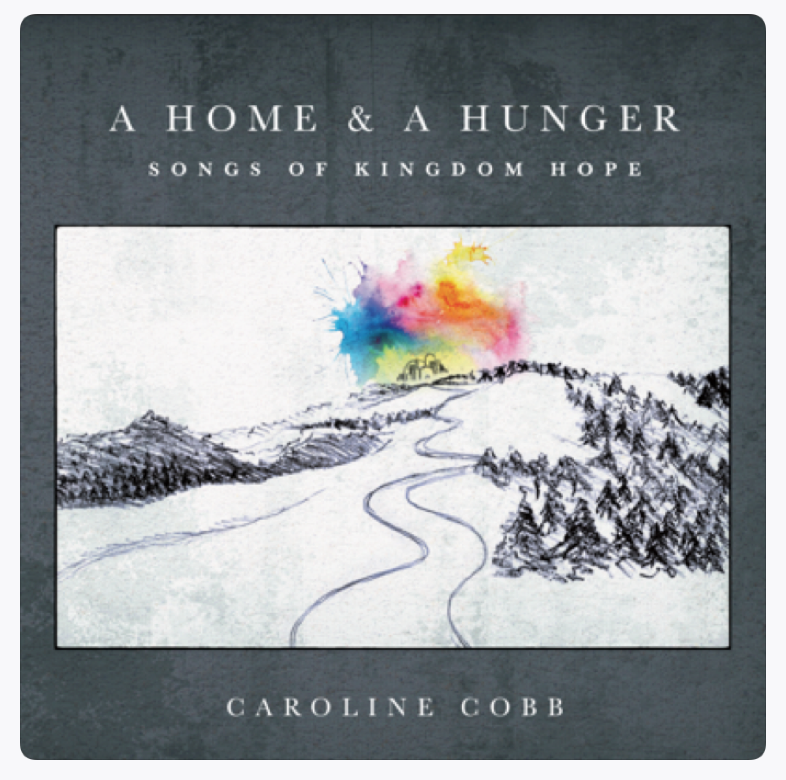 Caroline Cobb's new album is releasing today, A Home and a Hunger. I first learned about Caroline years ago when I heard her song Passover Song. I was mesmerized. I told everyone I knew about her album, The Blood and the Breath, then. Now, I cannot wait for you to listen to her new work about the kingdom and our longing for the new heaven and hew earth. Get it today. Jonathan Edwards is not the puritan, but he understands a little something about sinners and a seemingly angry God. When he was seven years old his dad left and this is the narrative we're introduced to in Jonathan's book LEFT: the struggle to make sense of life when a parent leaves. Whatever your life looks like, the chances are great that in some way you have been affected by the reality of divorce. Your parents, your grandparents, your siblings, maybe you yourself. It's a death that seems more common than death itself. I know far more people who have been affected by divorce than by the death of someone close to them. I experienced tragic death in my family (my 14 year old brother) the year before I experienced the tragedy of divorce in my family—and I swear divorce was the worse of the two. Jonathan does an interesting thing with LEFT, a careful balancing act of narrative and memoir, staccato sentences ripe with good theology—but isn't this like life? A constant experiential proof text? We observe, we ingest, we internalize, and then we prove our theology. LEFT is a book about a boy who was left by his father, but who felt left by his heavenly father for most of his life. It's a common story from children of divorce. It's mine and maybe it's yours. There is nothing in the world I hate more than divorce, and yet there is nothing more in the world that has shaped and shattered my poor and pitiful picture of who God was to me. Divorce led me straight to the place where I learned my paltry portrait of God was made in the image of the man and woman who birthed me, raised me, sent me, and broke me. But it wasn't until I came to face to face with that image that I was able to forgive the sinners who birthed me, raised me, sent me, and broke me. It was a careful distinction and a paramount one. One every child of divorce must experience if they are to walk through the shattered shards of what's left of their family. LEFT leaves no pretty picture of life after divorce. Jonathan is real about the struggles—even the ongoing ones. He confesses, he wrestles, he preaches, he stumbles. It's the story of a man who knows by the grace of God he doesn't have to make the same mistakes his father made, but also by the grace of God he does have to sort through them as part of his story. He says, "I began to understand that I didn't have any justice to seek, that true justice was God's...Reconciliation with my dad ceased to be my primary concern because I longed for his reconciliation with the Father so much more." This is the hinge upon which the door of growth swings for the child of divorce. When we begin to understand we are as much sinners, as faithless, as broken as the men and women who birthed us—in desperate need of the hands of a faithful Father. Jonathan Edwards is not the puritan, but he does understand a little something about sinners in the hands of a faithful God. When I was in high school I read the A.W. Tozer quote, "The most important thing about a man is what he thinks about when he thinks about God." There's no way I could have known that what I thought about God then, and would think about him for the next decade, would run my shred of faith straight into the ground. I cannot begrudge my misunderstandings. Sometimes we have to subtract until we've reached negative space before we can add what is true and holy and right and good. I would dive back into the depths of darkness once again without a second thought if I knew I would surface with the riches I found in 2010. And those riches? His character. Namely, what I thought about when I thought about God. Since 2010 these attributes are my buoys, my buffers, my strong-tower, my defense, my comfort, and my control. When all around me is sinking sand, I know who my God is in His unchangeableness. He is immoveable, unshakeable, ever present, and always good. Whenever what I think about God is incorrect and it informs how I think about everything else, I sink and quickly. But when my soul feasts on the truths of his character and his attributes, I am sustained. The most important thing about a man is what he thinks about when he thinks about the most important things about God. Joe Thorn's new book, Experiencing the Trinity: the grace of God for the people of God, does such a fine and succinct job of displaying God's character and I hope you'll consider grabbing one of these small books for yourself. Actually, what I hope you'll do is what I've done with his small book, Note to Self, and buy fifteen copies to give away. So many of us are limping along in our faith, with our eyes set on circumstances or ourselves. How much better to forget ourselves and see Him, robed in truth and beauty, splendor and goodness? When I first met Guy what I was struck most by was his weary constancy. Here was a guy going through the motions of life, fatherhood, writing, breathing, and doing it without the woman he thought would be beside him for the rest of his life. I never heard him complain. I watched him put one foot in front of another, fathering, writing, leading, working, breathing. He writes in the same way. There’s a weightiness to his words, not because they are weighty words but because they carry strength and endurance within them. They are the badge of a man who has sunk beneath the waters of suffering, who has subsisted on the bread of affliction, and who has seen the goodness of God in the land of the living and the dead. In Guy's new book, Earth and Sky, he writes of his life with his wife before her death, and what to do after she was taken from him so young. There is a tangibleness to the wrestling Guy does in the book, and I don’t think it’s just because I saw a bit of that wrestling in real life. I think it’s because Guy put his heart into the writing of this book—not for fame or for a name, but for his daughters. He suffered well because he was watched closely. I said to him one day a few years ago that they were learning how to grieve from him, watching him, and I couldn’t think of a better example. If you are grieving or you know someone who is, I recommend Earth and Sky in the same way I recommend A Grief Observed, because sometimes what we need is not all the answers, but a friend to walk alongside when the answers don’t come easily.